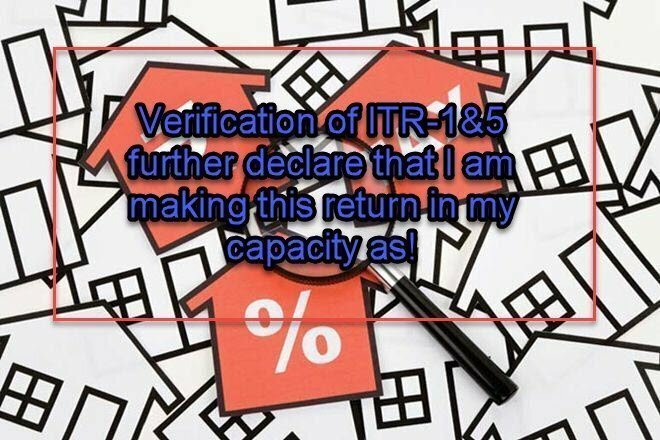 Home » Verification of ITR-1&4 further declare that I am making this return in my capacity as! After complete filling of your ITR1, on the last page, a verification portion is required by the Taxpayer. First Block of the form by default left filled from the information of your PAN card. The Second Block “I further declare that I am making returns in my capacity as self/representative and I am also competent to make this return and verify it”. Also Read: Income Tax Slab of Last 20 Years From AY ‘2001–2002’ to AY ‘2020–2021’. Income tax department left this option to select and declare whether you are submitting the return by your self or any your representative is appointed by yourself or any other legal source. PAN number is by default, further, you have to enter the place, (I am from Bhopal, so I enter BHOPAL). If you are filling ITR4, the scenario is different. If the individual or HUF income contributed from salaried as well as business or profession, ITR4 comes into play. In that case, the verification form required your capacity declaration. If you are an individual or salaried – you have to select ‘Self‘. In the case of the Hindu undivided family (HUF) – You must be ‘Karta‘. If you are running a partnership form including Limited Liability partnership (LLP) – The responsible person is ‘Partner‘. ‘Representative‘ opts when the individual, Karta or partner in legal form declare their representative to fill the return. Section – 140, Income-tax Act, 1961-2018, Sometimes the taxpayers himself is absent, not fit, mentally ill, unavoidable reason, minor, or any legal conditions, the declaration is mandatory, which reveal the person is representative or not.